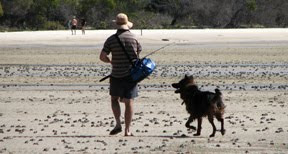 Me & Me Dog - Oh to be walking along a beach in Queensland with Shane and mitch. This morning I had a visit with my lovely Dr. Alicia. She is so nice and caring, I can usually count on a cuddle. During our conversation this morning I happened to mentioned that I write a blog. She was so happy with me, saying that this is a fabulous way to help me with my grieving and wonderful therapy. One comment she made, which I totally agree with was that the comments that people leave me is also helping me get on with my life. She also said that I am probably also helping my readers as well – I hope this is also true. She thought my “Davine Time” was a great idea to make sure I didn’t forget myself and that is exactly why I started it. Another hint she gave me was a way to help me with my health and weight. I have had difficulty with my weight for a number of years and have tried many many diets. So I thought maybe I will do a little monthly update on that front as well. Don’t worry I am not going to bore you all to tears with me going on about weight and food, because that would drive me crazy as well. I might just do an update once a week. “Davine Time” – Went for a drive with Shane and his Dad (Jack) to the waterfront. We had a lovely afternoon. I Love the confirmation that blogging is good for our health and wellbeing - thank you, Davine. Dr Alicia is so correct with her observation that other people's comments help with the process. I'm glad you share your journey ... it helps. Interesting doctor to have, not a suburban GP I suspect. I will be interested to see what you say in the health and wellness posts. I don't have a weight problem, but I do have concerns about my fitness. So I work hard on nutrition and on exercise. I bought myself a Wii for Christmas which is providing me much delight. I look forward to the new post - whenever it comes. Hugs sent your way. I am wondering if you ever received that package? I sent it ages ago now.